Published: Gollancz, 2010. ISBN 978-0-575-08210-6 [paperback £7.99; pp.303]. First published in hardcover by Faber, 1974. The previous paperback edition was a joint publication with Fugue For a Darkening Island (as “Omnibus 2”; Earthlight, 1999). Also available in translation. US edition: NYRB Classics, 2008. The Gollancz edition has an Introduction by Adam Roberts — the US edition has an Afterword by John Clute. 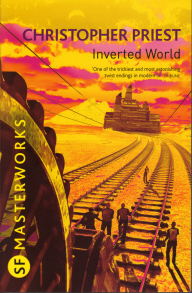 Inverted World is the closest CP come to writing a traditional science fiction novel, but although it is an early work it already contains elements of his later preoccupations with the nature and reliability of reality. Priest’s most translated work, it has been continuously in print for three decades. A brief outline of the story gives away few of the surprises that are to come: A mobile city, travelling on tracks laid before it and torn up behind it, is battling its way slowly across a hideously deformed landscape. The land spreads out impossibly in all directions, and time itself heads for surcease. One young man is destined to find out the truth about this inverted world.